In this vignette we show how the quanteda package can be used to replicate the text analysis part (Chapter 5.1) from Kosuke Imai’s book Quantitative Social Science: An Introduction (Princeton: Princeton University Press, 2017). To get the textual data, you need to install and load the qss package first that comes with the book. First, we use the readtext package to import the Federalist Papers as a data frame and create a quanteda corpus. docvars(corpus_raw, "author")[c(1, 6:9, 11:13, 15:17, 21:36, 59:61, 65:85)] <- "hamilton"
docvars(corpus_raw, "author")[c(10, 14, 37:48, 58)] <- "madison"
Next, we transform the corpus to a document-feature matrix. dfm_prep (used in sections 5.1.4 and 5.1.5) is a dfm in which numbers and punctuation have been removed, and in which terms have been converted to lowercase. In dfm_papers, the words have also been stemmed and a standard set of stopwords removed. ## Elapsed time: 0.239 seconds. ## Document-feature matrix of: 85 documents, 4,859 features (89.1% sparse). ## Document-feature matrix of: 6 documents, 8 features (97.9% sparse). ## 6 x 8 sparse Matrix of class "dfm"
## Document-feature matrix of: 6 documents, 8 features (91.7% sparse). 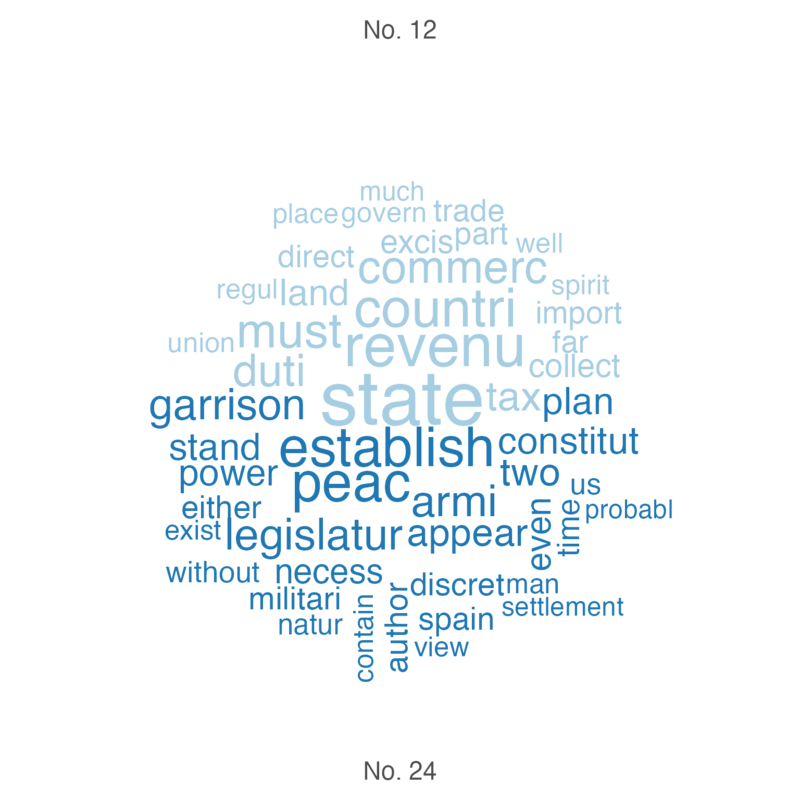 We can use the textplot_wordcloud() function to plot word clouds of the most frequent words in Papers 12 and 24. Since quanteda cannot do stem completion, we will skip that part. Next, we identify clusters of similar essay based on term frequency-inverse document frequency (tf-idf) and apply the \(k\)-means algorithm to the weighted dfm. ##  "No. 81" "No. 82"
##   "No. 1"  "No. 6"  "No. 7"  "No. 8"  "No. 9"  "No. 13" "No. 15"
##   "No. 16" "No. 17" "No. 21" "No. 22" "No. 23" "No. 24" "No. 25"
##  "No. 26" "No. 27" "No. 28" "No. 29" "No. 30" "No. 31" "No. 32"
##  "No. 33" "No. 34" "No. 36" "No. 59" "No. 60" "No. 61" "No. 65"
##  "No. 66" "No. 67" "No. 68" "No. 69" "No. 70" "No. 71" "No. 72"
##  "No. 73" "No. 74" "No. 75" "No. 76" "No. 77" "No. 78" "No. 79"
##  "No. 80" "No. 84" "No. 85"
##  "No. 11" "No. 12" "No. 35"
In a next step, we want to predict authorship for the Federalist Papers whose authorship is unknown. As the topics of the Papers differs remarkably, Imai focuses on 10 articles, prepositions and conjunctions to predicte authorship. ## Warning: 'as.data.frame.dfm' is deprecated. ## Use 'convert(x, to = "data.frame")' instead. Finally, we assess how well the model fits the data by classifying each essay based on its fitted value. 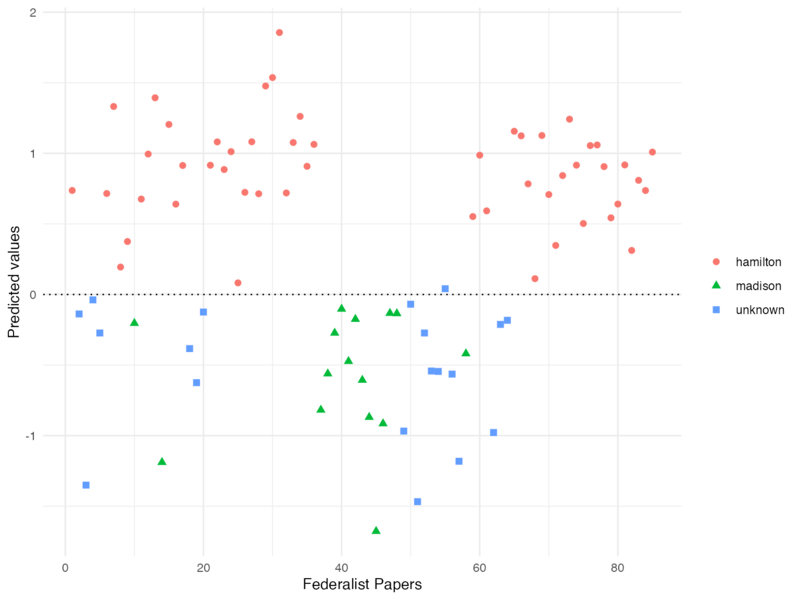 Finally, we plot the fitted values for each Federalist paper with the ggplot2 package.